What’s the Deal with the Docs? None of which is true. None of it! Take syncope, which means fainting. Sure, I fainted some in my school days but the roots of that were theological. The minute I joined the Congregational Church the fainting stopped. And sure I may have mentioned the time I fainted one midnight in a lovely old Vermont farmhouse where I was a guest but that was only because I had spent 8 hours on my feet that day, then driven three hours to get there. At midnight, in my little bed, I suddenly got a cramp in the leg of that accelerator foot that was so painful it lifted me like Lazarus from out-flat to upright in less than half a second. You can’t zoom the elevator to the top that fast without losing a little blood to the head, naturally and so I fainted. Got up too fast from that spectacular slump, and lurched toward the bathroom – where I fainted again, hitting my head on sharp corner of the bathroom vanity en route to the floor. That’s where the ‘neck pain’ came from: ten days after the episode when the finally did an X-ray to see about things my neck muscles were still in spasm. So yes I had neck pain, FOR A WHILE, yes. As for Osteoporosis I don’t know here the first doc got that one, unless it was from the little joke I made about Osteopenia, which I called the other osteo’s waiting room. I found that strange too. When I first sat down with the new doc I asked the guy Should I write down every procedure I ever had? Meaning should I write that I had my tubes tied back in ‘84? So there you are: if the first doc wrote down too much and wrote it down inaccurately then this second doc was willing to write down too little. So maybe the sipping straws that are a person’s fallopian tubes really aren’t that interesting to anyone 30 years down the line but something about the whole thing griped me. I should have told him I’d had my head replaced, like they did with old Jeremy Bentham when they staffed him and put him on display in that British museum. (You see his fake head on top, see, as his actual, somewhat worse-for-the-wear head rests under the chair on which he sits.) I wonder what either one of them would have written down then? 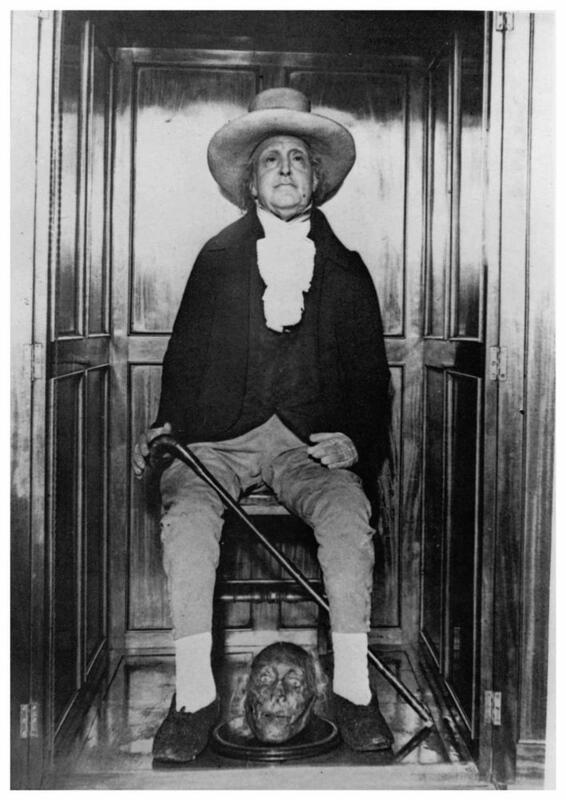 Here’s dead and stuffed Mr. Bentham now, providing some good perspective on many levels for us all . Previous postReady for the Week? Next postWho Needs a Shrink? Sounds like your Doc lied about you!!! Hi Terry, It all has to do with billing. Physicians can’t bill for back pain; it has to be a herniated disc, etc. I don’t think he lied intentionally, he just beefed it up a bit. They need a diagnosis to get paid by the insurance companies. They have to make a living; their malpractice insurance is sky high. If he’s new, it will take him years to pay off his education. Hope you are healthy now. Your humor is on a whole other level now, Ter. I’m addicted!